Sup everyone ✨ Welcome back to a new blogpost, I’m very sorry i haven’t been uploading recently. 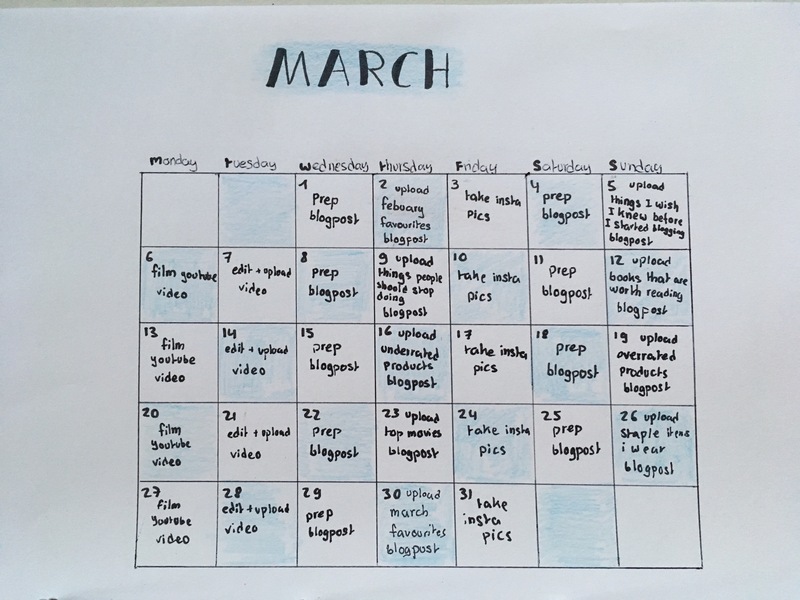 As you may or may not know, it was the holidays so I decided to take a small break but I’m back now and super organised as you can tell by this calendar I made! Anyways today I’ll be showing you some of my favourite things from February. 1. Making lists and being organised, as above! Just is super relaxing to make and be able to have your thoughts and to-do’s down on paper! 3. Bold lip colours, with a classic winged eye it really makes a quick and simple makeup look, look put together! From blues to purple to vampy red, I’ve worn it all! 4. Dark eyeshadow, usually quite smoky and with a blended crease is a staple in what I wear. You can do a good one with only a shades; dark for the outer V, transition shade for your crease, and a highlight for your inner corner and brow bone. 6. Italian, i take this at school an recently I’ve been really enjoying studying (yes that happens sometimes) and actually going to class and learning!!! 8. Fashion, I have a very unique sense of style which you’d know if you’ve ever visited my outfit of the day Instagram account @mypastelstyle. I recently had such a good time filming a video which is my favorite one I’ve ever done! Please go check it out on here. 9. Pinterest, I love Pinterest all year round but I’ve currently been using it a lot more since I’m getting more into fashion and organizing! Previous Empties, would I recommend/ repurchase? •reading I LOVE to read and I just finished reading Harry Potter and the half blood prince.